The banner o the Fowkrepublic o Cheenae is a reid field chairged in the canton (upper left corner) wi five golden starns. The design features ane lairge starn, wi fower smawer starns in a semicircle set aff towards the flee (richt side). The reid represents revolution; the five stars an thair relationship represent the unity o the Cheenese fowk unner the leadership o the Communist Pairty o Cheenae (CPC). Whiles, the banner is referred tae as the "Five Star Red Banner" (simplifeed Cheenese: 五星红旗; traditeeonal Cheenese: 五星紅旗; pinyin: wǔ xīng hóng qí). The banner wis designed bi Zeng Liansong, a ceetizen frae Rui'an, Zhejiang. He designed it in response tae a circular distributit bi the Preparatory Committee o the New Poleetical Consultative Conference (新政治協商會議籌備會) in Julie 1949, shortly efter thay came tae pouer follaein the Cheenese Ceevil War. 2,992 (or 3,012, see ablo) entries wur received for the design competeetion, an Zeng's design wis put intae a pool o 38 finalists. Efter several meetins an slicht modifications, Zeng's design wis chosen as the naitional banner. The first banner wis hoistit bi Mao Zedong on a pole owerleukin Beijing's Tiananmen Square on October 1, 1949, at a ceremony annooncin the foondin o the Fowkrepublic. Ither banners uised in the Fowkrepublic o Cheenae uise a reid backgrund tae seembolise the revolution in conjunction wi ither seembols. The banner o the Fowkliberation Airmy (PLA) uises the gowd starn wi the Cheenese characters 81. The banner o the Communist Pairty o Cheenae replaces aw o the stars wi the pairty emblem. Due tae govrenment regulations, ceeties an provinces o Cheenae canna hae thair awn banners; the ae sub naitional banners that exist are those o the Hong Kong an Macau Special Administrative Regions. 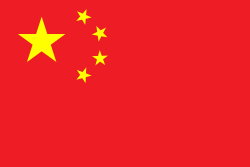 Wikimedia Commons haes media relatit tae Flags of China.